I’ve never been good about routines. It’s 1 o’clock in the afternoon, and the kids are just now “doing their morning things.” That’s how we do it, and I’m alright with that. I’ve never been good about routines. Reminding the kids to brush their teeth and get dressed everyday — yes, they need to be reminded to put on fresh clothes — just was not happening. So, here’s our solution. I’m sure I developed this chart from something I saw on Pinterest. The idea is that the kids can be reminded of their self-care responsibilities without my having to tell them each day. Of course as it has worked out, I still have to ask them about it every morning — or afternoon, or whenever I think of it. Did you guys do your morning stuff yet? At least I don’t have to ask about each thing. That’s a good 15 questions. And honestly, it was hard to not become frustrated -- even though I eventually realized they just didn't remember what they were supposed to do. It’s going well so far. I’m sure it’ll eventually be forgotten — like the chore charts and the school schedules and art — but we’ll give it a go. By the time it gets old, perhaps, they won’t have to be reminded at all. 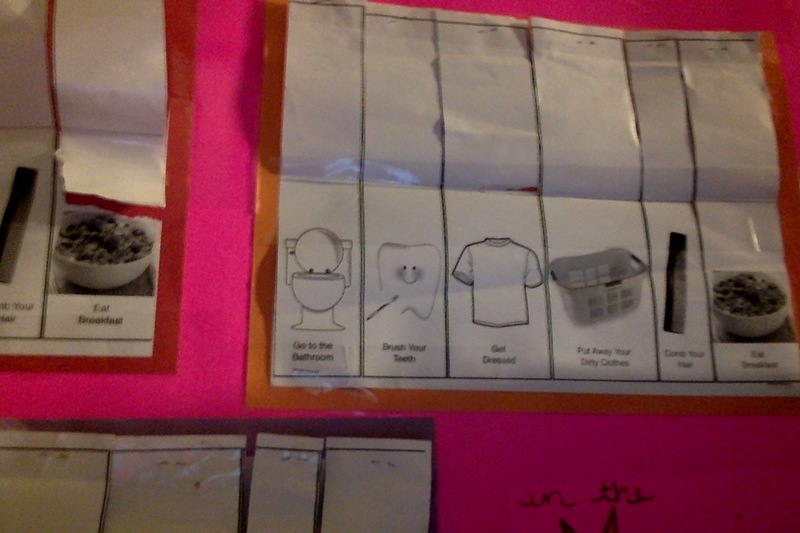 Each child has a chart with six tasks to complete in the morning. The top portion of each chart is split into tabs which are held in the up position by strips of velcro. Once a task is completed the tab is folded down covering that task/clipart with DONE. The kids helped me make the charts -- a simple craft project with paper, tape, and glue. Make your own. Here's the download.